With interactive push messaging being integrated in iOS 8, it’s clear that push is a crucial tool to re-engage users who have left your app. Remember from previous Localytics data that 1 in 5 apps are only used once! But just sending a broadcast push message to all your users is a poor strategy to get them to re-engage. Research from Localytics shows that sending highly targeted, personalized content to people who have left your app is a much more effective way to both re-engage and guide them toward a path or action you would like them to take. When push messaging is integrated with analytics to identify key user segments, open rates and conversion rates show a drastic increase. 52% of people opt-in to receive push notifications when they download an app. This number is slightly higher for Android, with the platform breakdown at 59% Android and 46% iOS. This discrepancy is likely due to the fact that Android push notifications are on by default. IOS, on the other hand, asks the users during their first session if they would like to enable push notifications. However, with iOS 8 integrating interactive notifications, push messages will transition from a reminder and re-engagement function to a fully integrated app feature because users will be able to interact with the app through a push message without ever actually entering the app. However, opt-in rates are only half the story. Push messaging is a double-edged sword, and when not used masterfully, can turn a user off to your app and possibly uninstall it in frustration. 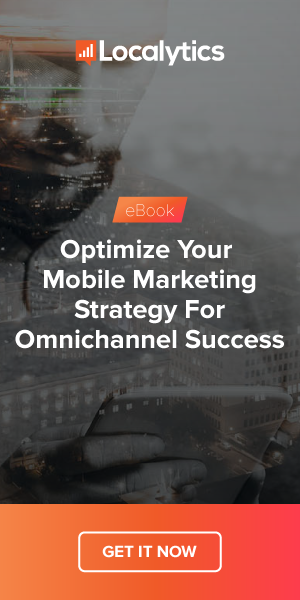 Understanding your user segments and their behavior, and personalizing your push messages, is extremely important for effective 1-to-1 mobile marketing. Marketers who segment their push messages compared to those who blast them to all users see significant improvement in engagement. According to Localytics data, broadcast push messages are only opened by 3% of users. However, this rate increases to 7% if the push message is segmented by user behavior and preferences. In other words, segmented push messages have over double the open rate as push messages blasted to everyone. Using analytics, a clever app marketer can identify the typical paths taken and where in the funnel users are dropping off such as an abandoned checkout process, or gamers who are stuck on a certain level. By subsequently sending a push message to address these ‘pain points’ with, for example, a coupon or extra life, users are twice as likely to return to your app compared to a generic push message. In a nutshell, the best solution is to look for meaningful segments in your app and send them targeted push messages that address their behavior or preferences versus a generic push blast. A push message – generic or targeted – can certainly bring a user back into the app, but it doesn’t guarantee that the user will actually complete the action you set out for them to do. Once again, sending intelligent push messages based on user behavior will increase your conversion rate. Localytics research shows that once a push message is opened, only 15% of users who clicked ended up converting, compared to 54% of users who clicked on a segmented push message. By denoting a specific conversion event as part of their campaign, app developers can track if a user does the intended action the push message guided them to do. Conversion events can range from “reading an article” to “finishing a level” to “completing an in-app purchase,” with varying conversion rates depending on the event. These conversion events are unique to each app and provide clarity into events that directly lead into an app’s ROI. Segmenting and personalizing push messages is an excellent way to get users re-engaged with your app. Rather than spamming broadcast pushes to everyone, a little personalization goes a long way to increase click through and conversion rates! Localytics is the leading analytics and marketing platform for mobile and web apps across more than 1.5 billion devices and 28,000 apps. Localytics processes 50 billion data points monthly. For this study, Localytics looked at apps that have integrated push messaging across both iOS and Android. The opt-in rate is derived from only apps that have push messaging incorporated in the app. For click rates, the number is derived from the users who received a push message and then opened it. For conversion rates, the number is derived from users who clicked on the push message and then completed the specified conversion event. This timeframe for this study was July 1st to July 31st, 2014. All results are based on worldwide app usage.